It has been less than two months since I moved into my current flat and I couldn’t be happier. I found a space with white walls, high ceilings and lots of natural light. 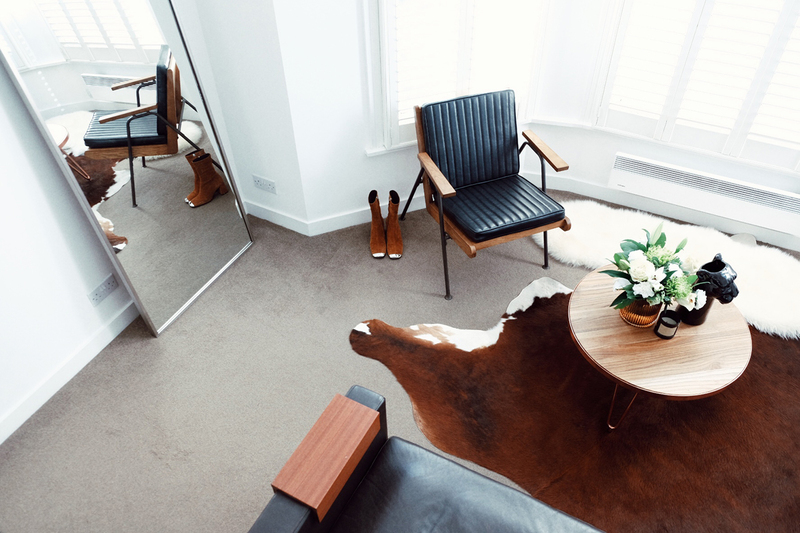 In a nutshell, a blogger-friendly apartment. Yay ! 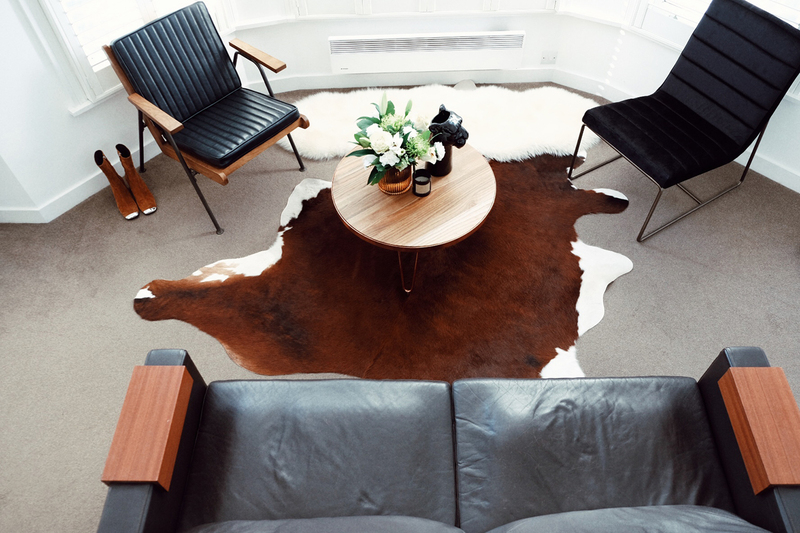 My living room is my favourite part of the flat, as it has some of my favourite furniture pieces and is a great place to hang out with friends. I was fortunate enough to be gifted a few pieces from Cult Furniture to help complete my living room space. I had to decorate around my landlord’s dark brown (almost black) leather sofa with wood details. Naturally, I opted for pieces with leather and wood details in them. 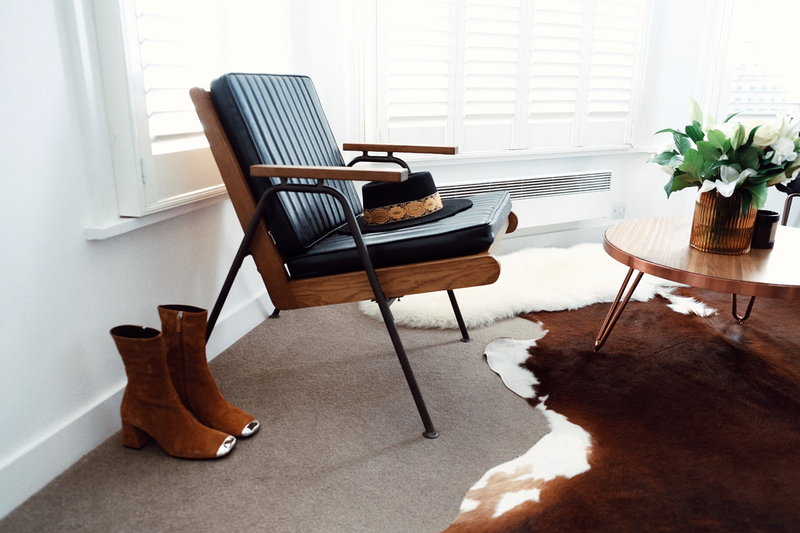 One armchair that caught my eye was the Wickham Industrial wooden armchair. 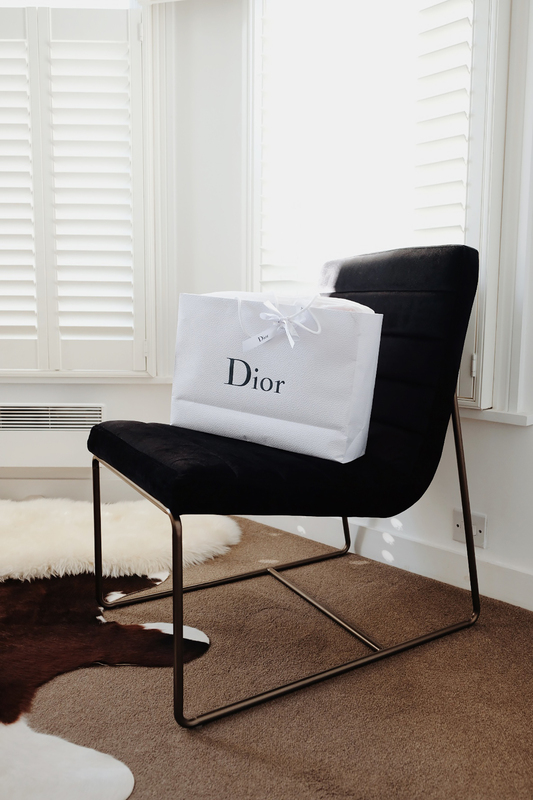 I used to have an industrial clothing rail in my old flat, so I have always gravitated to that type of furniture. 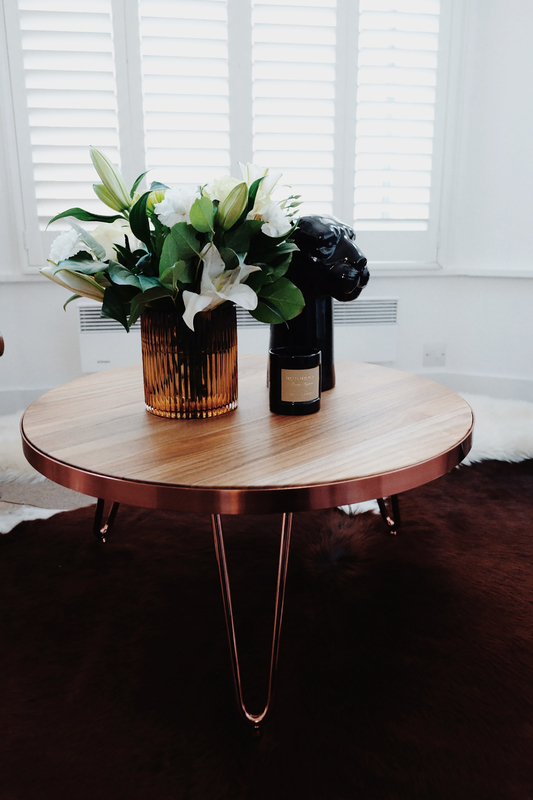 The centrepiece of my living room is my Hairpin Round Coffee Table with rose gold legs. It is just big enough to hold a vase, candle and decorative ornaments on it but also small enough to not take up too much living room space. My black Kelby Lounge Chair is positioned in a spot where you can catch the morning sun at a perfect angle while I have my first coffee. It has also doubled as a great spot for putting my shopping bags on when I come home. You’ll be seeing a lot of it on my Insta-stories this winter. Thanks to my full-length floor mirror from West Elm, my living looks even bigger. It’s main purpose is for outfit selfies, though. I am, after all, a blogger. My space is lovely and unique to me. I love that I have mixed different colours of metal or brass when it came to the chairs, coffee table and mirror. Not everything has to be one shade. 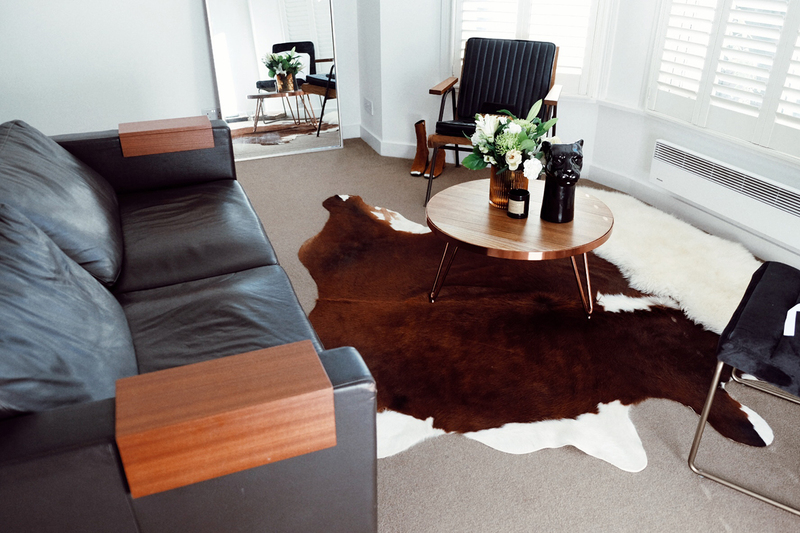 The cow and faux fur rugs from IKEA and John Lewis do a wonderful job of making the room feel cozy. Who knows what I will add along the way over the next couple of months. It is my living room, after all, and I plan to make it comfortable for me.